We’ll go for the great Reformation — For Lincoln and liberty too! Alden Michels leads "The Vacant Chair" as Washington Revels Heritage Voices and the Roustabout Old Time String Band perform at Ford's Theatre. Photo by Terry Winslow. 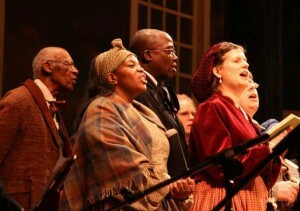 The echoes of this campaign song, made famous by songster and abolitionist Jessie Hutchinson, rang the rafters as the Washington Revels Heritage Voices and the Roustabout Old Time String Band helped celebrate Lincoln’s Birthday Open House at Ford’s Theatre in Washington DC on February 12. 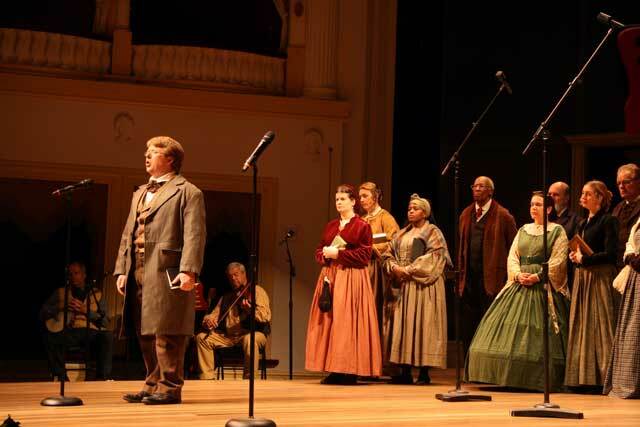 The Heritage Voices appeared as part of a daylong celebration honoring the legacy of President Abraham Lincoln and the grand opening of the Theatre’s new Center for Education and Leadership, slated to open later this month. Being able to sing this historic and poignant music while reading the words of men and women who lived during the Civil War is one thing, but presenting it in a place so imbued with Abraham Lincoln’s presence—and the history of that fateful night in April 1865—is another. 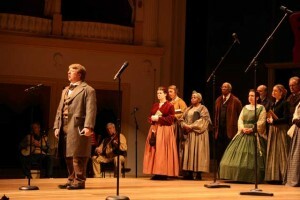 Heritage Voices (Jim Harkless, Yewande Odetoyinbo, Gregory McGruder, and Helen Fields pictured in the foreground) perform "The President's Hymn" at Ford's Theatre. Photo by Terry Winslow. Over this past year—beginning with performances in the Fall of 2010 and a CD recording featuring music of the American Civil War, “Hard Times Come Again No More“—Washington Revels Heritage Voices have performed in many historic sites throughout the metropolitan Washington area. The group presents a wide variety of music from the era, including African American traditional music and spirituals, as well as narration and readings from primary source materials dating back to the mid-nineteenth century.